We are living in a day and age where actually talking on the phone, like voice-to-voice, ear-to-ear style, has become a laborious, inconvenient rarity. People can have an entire text conversation without typing a single word! That said, it is essential that anyone born prior to 1980 gets up to speed on modern communication lest we all become obsolete and illiterate. When I say modern communication, I’m not talking about text messaging. Evengrandparents know how to text these days. I’m talking about emojis. You’ve seen them, but there’s a chance you don’t know exactly how to interpret them, much less how to use them correctly. Fear not friends, this simple emoji tutorial will help you effectively communicate with your hip, young co-workers, college-age kids, angsty teens, and everyone in between. Everything is fine in moderation. Don’t go overboard expressing yourself via mini-animation. This rule should also be applied to punctuation usage as well capitalization usage. One exclamation point is adequate to convey your excitement, and it is seldom, if ever, necessary to type in all caps. Use your context clues. These interpretations are a general consensus but are not hard rules observed by every single emoji user. Some emojis are multifaceted and can be used in entirely different contexts. Therefore, it is essential that you look at the conversation holistically and use your context clues to help guide your interpretations. Above are the 30 most frequently used emojis. We are going to break down these mini caricatures one by one so that you can feel confident and equipped to hang with the best of those who speak in texting tongues! This particular set of emojis isn’t too difficult to interpret. They’re happy, which means that whoever is sending them to you is happy, too! These are fun to receive. The second emoji, tears-in-eyes-laughing, is most typically used to communicate something hilarious. So if someone sends you that emoji in response to a text, give yourself a pat on the back– you are cracking people up! Keep an eye out for the first emoji– the all teeth grin– it can be used to try to charm the reader after a line like this: “I accidentally ran out of money, can I borrow some for the weekend?” Let the reader be warned. The heart eye and kiss heart emoji pair nicely together. If you are hearing details from the weekend, or getting a picture of college dorm room decor, be sure to send the heart eyes to show you are loving what you see. This set is pretty easy to interpret as well. If you are receiving any of these emojis, your person is not having a good day. The first emoji can be used for more than one emotion, but is most commonly used to convey that something was awkward or he/she felt embarrassed. For example, if you see the flushed face emoji following a line such as, “I left my jersey at home” that means your person is desperate for some help. You might see it after a line like: “I can’t believe I said that” which clearly shows embarrassment. This is your cue to assure your person that this– whatever it is– too shall pass. The others are fairly obvious emotions: the worried face communicates, “Oh no!” The apologetic face communicates feeling bad; the grumpy face conveys a pouty or unenthused“I-don’t-care response.” And obviously, the angry face communicates disappointment and frustration. Use your context clues to interpret what your person is trying to say. Typically if you’re seeing these, your person just needs a little encouragement. To put it bluntly, all too often when people are texting you emojis they want to vent and they want you to empathize with them. If you find yourself receiving texts of complaints and negativity, and you can tell your person wants you to feel for them, this set of emojis is your go-to. This is a progression of emotion that says that you recognize that your person’s plight is not fun. 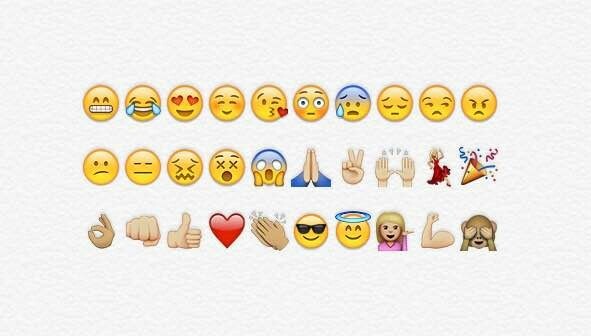 Everyone has different levels of dramatic response, so think of the these emojis communicating the following lines (from left to right). 3. OMG (oh my gosh) I hate that for you! 5. NOOOOO!! (Please note that I used all caps, excessive O’s, and 2 exclamation marks. That is because this emoji conveys utter despair). Let it be known that the second to last emoji can be used in response to a selfie to say your person likes what they see. It is very unlikely you will receive this from your children, but you may want to keep tabs on whether or not your kiddos are sending (or receiving) this emoji in response to flattering selfie exchanges. Likewise, the furthest right emoji, the emphatic “NOOOOO! !”, can also be used to show uncontrollable admiration when coupled with the heart eye emoji from the first set. 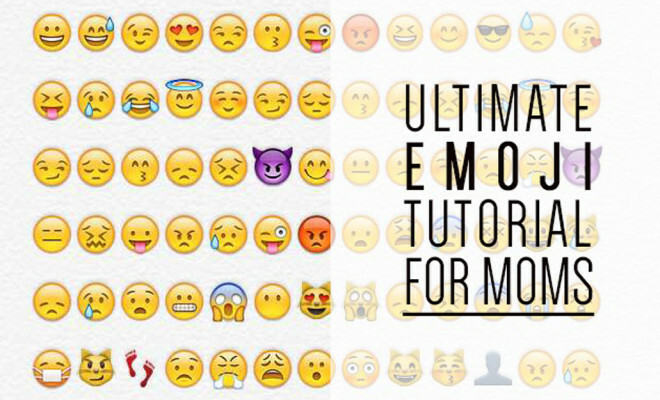 These are your celebratory, cool-mom emojis. If you know a family member has a meeting, game, interview, or test one day, or you just want to let them know you’re thinking about them, send the prayer hand emoji. If you can tell your kid is trying to end the conversation with you, casually send the peace fingers to let him know you get it and you’re cool with (even if you’re not)– if you can keep conversations short and sweet, they’ll keep calling, I mean, texting. If you get word that something goes well, feel free to send an assortment of the last three emojis. Celebration is one instance where “moderation” can take a hike! The cha-cha girl is particularly fun to send in the instance that you get a cute outfit pic from a daughter or niece. These emojis are going to let you know that your person is feeling pretty good and wants you to dote, flatter, and praise. If you’re a mom, this is a soft toss to show your babies some lovin’! The shades emoji conveys that the sender is feeling pretty cool. You will most likely get this from your guys, while the cheery pink service girl will most likely come from your girls. The message is the same, “I’m killin’ it” (translation: “killin’ it” means doing things really well). The muscle arm is typically used after a line like, “Going to get to work! Here we go!” this is your cue to refer to your “way to go” emoji set and respond accordingly. Be wary of the halo emoji. Similar to the all-teeth-grin from the first set, this can be used in attempt to charm you. Maybe you don’t mind being charmed though. If that’s the case, bust out your kiss heart emoji, also from the first set, to let your little angel know you are just fine being buttered up! Last, but not least, is the bashful “see no evil” monkey. This little guy is complex and can communicate a couple of different things. At face-value, it’s communicating “I didn’t see that”. It would be appropriate to send this after receiving a text such as, “Hey mom, I ran out of gas so I took brother’s car for the night. Don’t tell him!” this lets your sweet little angel know that you’ll play dumb if confronted on the matter. The monkey can also convey embarrassment if the sender did something silly and is feeling bashful. Please note that this reflects a low level of embarrassment, as opposed to the blushing, awkward faced emoji we discussed earlier. Lastly, the bashful monkey can be used to receive praise humbly. If someone is singing your praises about your killer dish from the potluck last weekend, throw in the bashful monkey to playfully and humbly receive the compliment. Do you feel cooler yet? You are well on your way! If you don’t have it already, download the emoji keyboard app for your smartphone and get to texting!